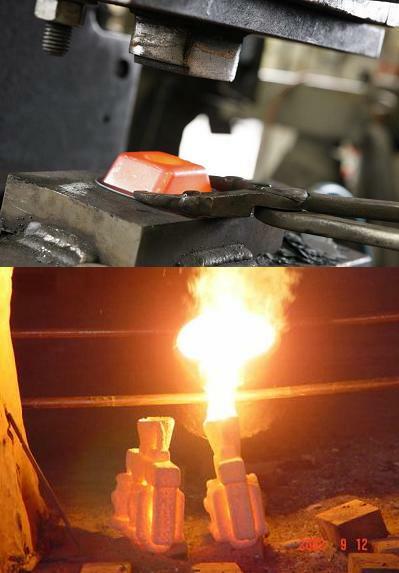 What Are The Differences Between Drop Forgings and Investment Castings? Home » News » What Are The Differences Between Drop Forgings and Investment Castings? Process: Drop forging is a metal forming way that utilize forging press putting pressure on metal bars after heated by medium frequency furnace, then get net-shaped precision parts. Investment casting is that first melting raw material into liquid, then pour the liquid into the mould and cooling down to obtain solid metal parts. So the production processes of them are quite different. Surface finish: According to different production processes, you will see a more smooth surface of drop forgings. There also even exist external defects of investment castings, like air vent, ect. Mechanical properties: As drop forging is a metal extrusion process, so for the same material, the mechnical properties of drop forgings will be much better than that of investment castings. Customers will choose drop forging process to manufacture parts who will bear force. Besides, the worklife of drop forgings are longer. Costs: As the surface finish and mechanical properties of drop forgings are much better than that of drop forgings, so both the mould cost and production cost is much better. Machining requirement: Less machining is required for drop forgings, so it will save much extra cost and time.